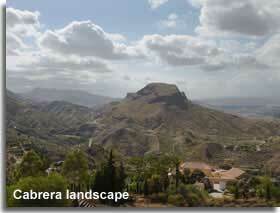 Cabrera mountains and Cabrera village... a unique setting for mountain property within close proximity to the coast. 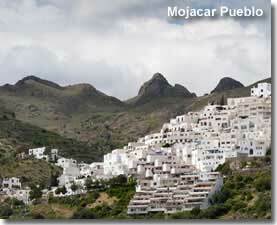 A relatively small sierra, compared to the others in Almeria, it rises from the Mediterranean sea and provides a mountain backdrop for the beach resort of Mojacar along with a hilltop setting for Mojacars whitewashed pueblo nestled in the coastal foothills. Further inland, this unique mountain setting has been tastefully developed, offering an escape from it all haven close to the beach. With location in mind, individual villas are spread through the hillside leading up to the mountain village of Cabrera, with spectacular mountain vistas and panoramic seascapes, high living does not get any better than this. 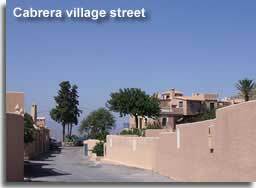 Cabrera village, set high up in the mountains, is a small and select development of luxury homes that was initiated back in the late 1980s, though the area holds much historical evidence of earlier settlements. The architecture and setting of the village was the idea of a man named Peter Grosscurth, all the homes, and the surrounding mountainside villas, are designed and styled with traditional Moorish characteristics, such as courtyards, archways, and domes, and all are painted a terracotta colour that blends perfectly with the landscape. Although Peter is no longer alive, modern Cabrera remains true to the principles that he set down. 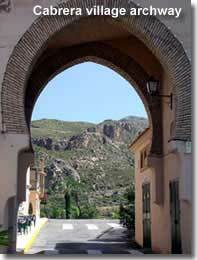 The village archway, named after Peter and now a symbol of the Cabrera, bears a plaque in his remembrance, and the San Pedro Fiesta, held in June each year, is also celebrated in his honour. A select housing development set in the lush valley at the foot of the Cabrera, hidden from view from the outside world. 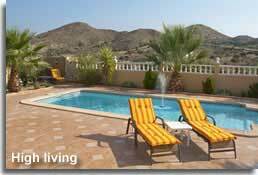 This rural retreat was built around what was the Cortijo Grande golf course, sadly the course did not survive the financial crash of recent years, however the course does provide a central and beautiful focal point for the valley and away from the extreme heat of the summer, lends a beautiful green heart to Cortijo Grande. 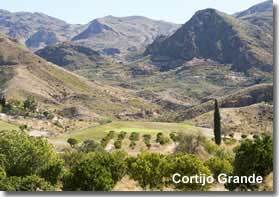 The Cortijo Grande Owners Association are doing their utmost to preserve this course, for further information please visit the Cortijo Grande Golf website. 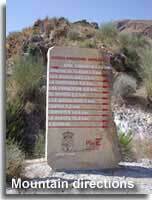 Signposted access to the mountains, Cortijo Grande, and Cabrera village, is best achieved from the AL-150 which connects the village of Turre to the AP-7 motorway. 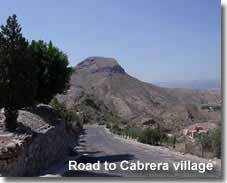 After passing Cortijo Grande, the road reaches a junction, to the left is the road to Cabrera village, and to the right is the route over the mountain range towards Sopalmo and Carboneras via several little hamlets, some now abandoned and in ruins. Alternative access to the mountains is signposted from Turre village, offering a direct route to Cabrera village and a second road over the mountains, via the villages of El Dondo and La Adelfa. These two mountain roads meet close to the Mezquita peak, the highest of the range at 962m above sea level, and the village of Los Moralicos, before continuing to Sopalmo. Either direction offers an interesting walking trail or challenging mountain bike ride. By vehicle the route can be a little hair raising, there are many sections of the road that have no roadside barriers and there are some very steep inclines. Of course the mountains can also be explored from Sopalmo village, taking the trans-Cabrera route in the opposite direction. Close to home for me, I call these mountains the pretty mountains, when viewed from my roof terrace, just before sunset, their contours and crevasses are accentuated by the angle of the suns last rays intensifying their rugged beauty. It is a stunning sight to see and it reminds me that I live somewhere really special. This location has an appeal for many, clear night skies attract astronomers, while the luscious scenery captivates many an artists imagination. The Sierra Cabrera offers opportunities for nature walking, hiking, climbing, mountain biking and quad biking, there are bowling clubs close by, and the coastal resort of Mojacar, with all its amenities, is only a twenty minute drive away. 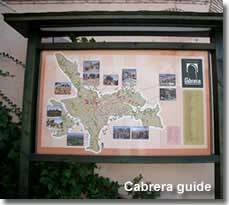 A mapped guide to Sierra Cabrera is detailed on a placard at the entrance to the village.